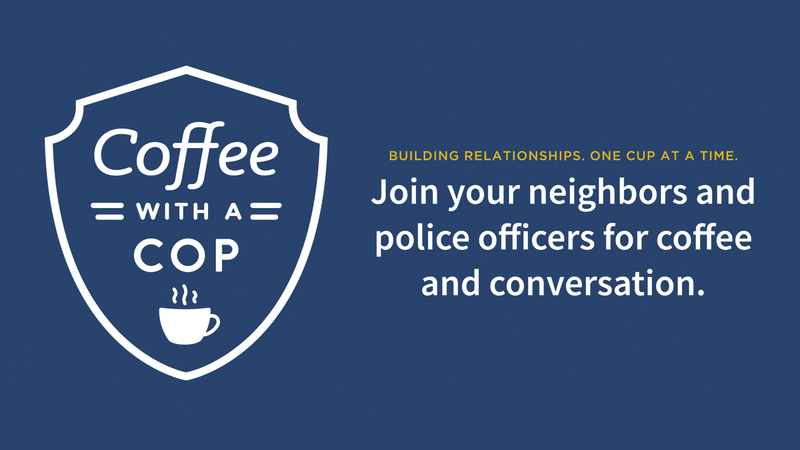 The event takes place October 3 from 9 to 11 a.m. at Starbucks in Mountain Village’s Heritage Plaza. 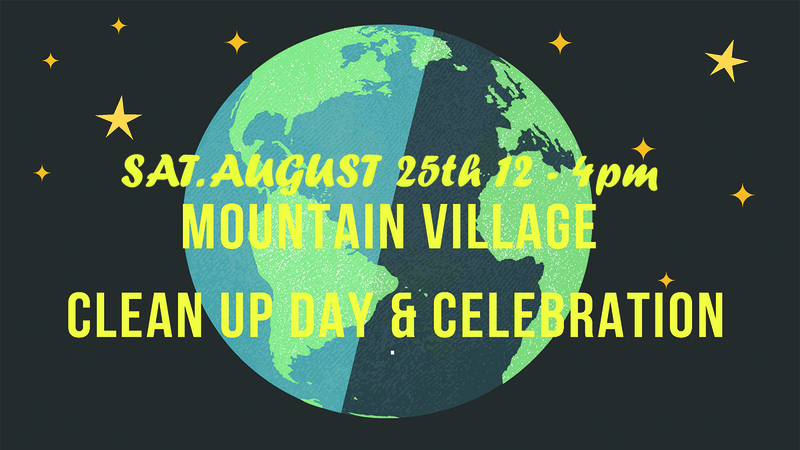 For more event information, contact Mountain Village Police Department by email, (970) 728-9281, and visit our event page on Facebook. 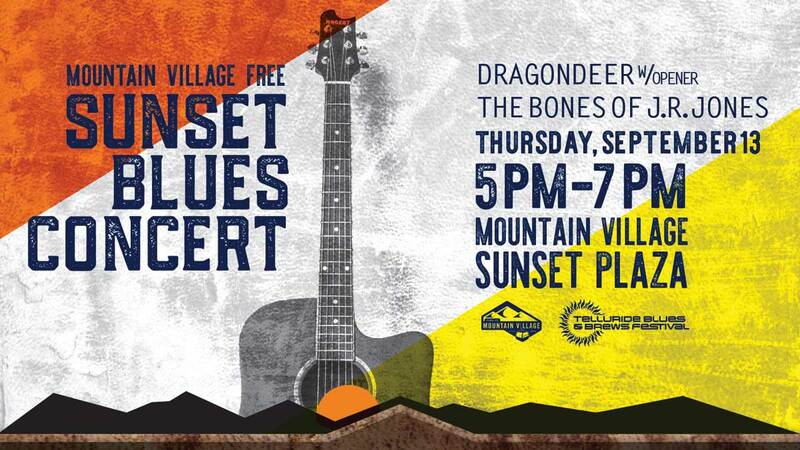 Telluride Blues & Brews Festival kicks off in Mountain Village’s Sunset Plaza for the Sunset Blues Concert featuring Dragondeer and The Bones of J.R. Jones on Thursday, September 13 from 5 to 7 p.m. The event — a short and scenic gondola ride away from the Town of Telluride — is free and open to the public. Having Denver’s Dragondeer kick off the Main Stage festivities is the best reminder that this is a blues-loving festival. Their first, full-length album, If You’ve Got the Blues, was released earlier this year and captures perfectly the band’s focused, passionate live energy. Recorded in Topanga Canyon in California, the record reflects the band’s belief that we’re all in this together. “It’s about sticking by your loved ones and being there for ’em when they need it; rising up your tribe,” said Eric Halborg, Dragondeer’s lead vocalist, guitarist and harp player. Halborg’s smoking harmonica runs and blues-perfect vocals pair up well with Cole Rudy’s stinging pedal steel work. Drummer Carl Sorensen and bassist Casey Sidwell drive Dragondeer like it’s a Rolls Royce with a psychedelic paint job. Careening from deep Mississippi blues to far-out jams, this is a band with chops, attitude and the swagger it takes to get this party started. The Bones of J.R. Jones, “Jonathon Linaberry” is a one-man band from upstate New York that will get into your very bones. His music is an earthy blend of blues, soul and Americana and he plays every single instrument you hear. It can make for a solitary existence, playing and touring solo as he does. But the music is irresistibly engaging. It’s a sound that is gritty and moody and filled with confidence and swagger. It may bring to mind the stripped down, beefy blues of early Black Keys. His voice is rich and dark and his playing is at once focused and loose. On Jonathon’s latest record, Ones To Keep Close, he recruits other musicians with whom to work, resulting in a must-have collection of songs that are powerful, introspective and downright rocking. Now get your bones to the Blues Stage and shake ‘em. Both artist sets are scheduled to highlight the scenic sunset backdrop from the lawn in the Mountain Village Sunset Plaza. The Town of Mountain Village’s Entertainment District allows a fluid social atmosphere where alcoholic beverages purchased from associated restaurants can be taken into the Common Consumption Area and enjoyed during the concert. The free event will take place rain or shine. Supporting sponsors are The Town of Mountain Village, Telluride Ski Resort, Sierra Nevada Brewing, SBG Productions, and the Telluride Mountain Village Owners Association (TMVOA). For a full schedule of events or to purchase tickets to the Blues & Brews festival, visit TellurideBlues.com. The towns of Mountain Village and Telluride are connected by a three-stage gondola system starting at Market Plaza in Mountain Village and ending in Telluride at Oak Street Plaza. It takes about 12 minutes to get from one town to the other. During the festival weekend, gondola operating hours are from 6:30 a.m. to 2 a.m. Friday and Saturday, and until 1 a.m. Sunday. Long lines are possible during peak times. In addition, Dial-A-Ride will remain open 30 minutes longer than the gondola all three nights and the festival transportation partner, Telluride Express, has a fleet of customizable transport options available. Due to the large number of parked vehicles during the festival weekend, the Town of Mountain Village has set aside specific parking spaces for its businesses and residents. Mountain Village residents who have procured a parking permit can park in the Market Plaza Parking lot. 26 spaces located along the rock wall are designated for permit holders and are available on a first-come, first-served basis; overnight parking is not allowed. Resident parking permits are also valid in the North Village Center lot; overnight parking is not allowed. Individuals without parking permits must park their vehicles where directed by parking staff. Free parking in the Gondola Parking Garage will begin Thursday, September 13 at noon and end Monday, September 17 at noon. Other parking options include the North Village Center pay-to-park surface lot; overnight parking is not allowed. Short-term parking will be available for those doing business in Mountain Village; times will be enforced. Alternatively, for those shopping, dining or recreating in Mountain Village, we encourage the utilization of Heritage Parking Garage, located off Mountain Village Boulevard across from Hotel Madeline. Parking costs $2 for each hour until exit, $35 maximum in a 24-hour period. 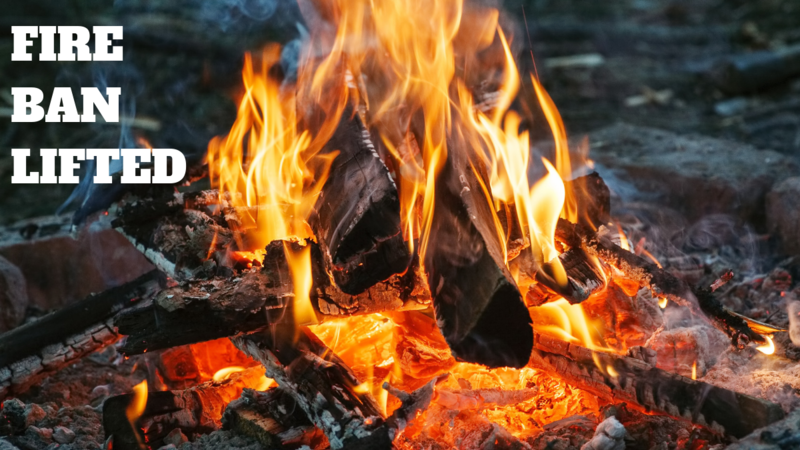 In conjunction with unincorporated San Miguel County, the Town of Mountain Village has lifted all Fire Restrictions on Wednesday, September 5 due to recent rainfall and decreased fire danger across the county. Connect with us on social media: Twitter, Facebook, Instagram, LinkedIn, and Nextdoor. Receive emergency notifications and updates on the San Miguel Sheriff’s Facebook page and on Twitter. Mountain Village Broadband customers will be able to take advantage of new speed increases in their internet service packages, at no extra cost. Broadband Services Director, Steve LeHane said that it would be increasing the speeds of its Internet service packages for customers in Mountain Village with download speeds increasing up to 65 percent for some customers. Eligible customers will see significant changes in their service depending on their package. Choice Customers with 12Mbps Internet download speeds are being upped to 20Mbps; Entertainment Internet subscribers who currently have 20Mbps are going to 30Mbps, and Ultimate subscribers are being upgraded to 50Mbps. New service changes are now in effect. If you continue to experience previous speeds at this point, please contact us for help at (970) 369-0555 or by email. 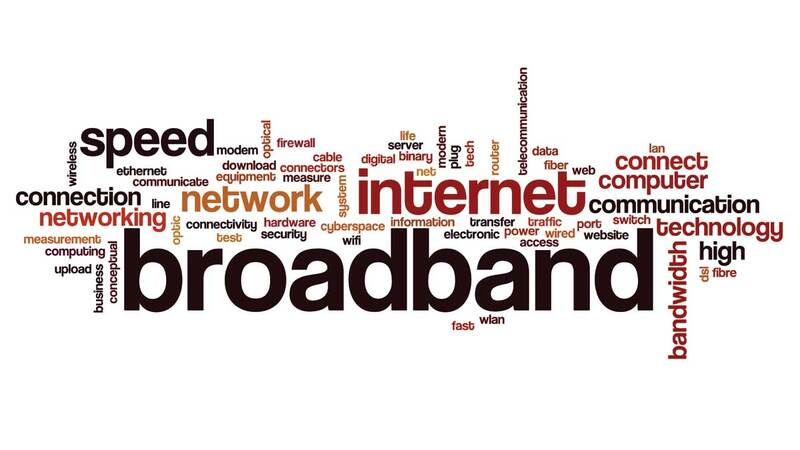 For questions on your service or to order new or upgraded service, please contact the Mountain Village Broadband Department at (970) 369-0555 and email or by visiting townofmountainvillage.com/internet. The final ‘A Walk with the Mayor’ event takes place today, Tuesday, August 7 from 9 to 10 a.m. beginning in Mountain Village’s Heritage Plaza. 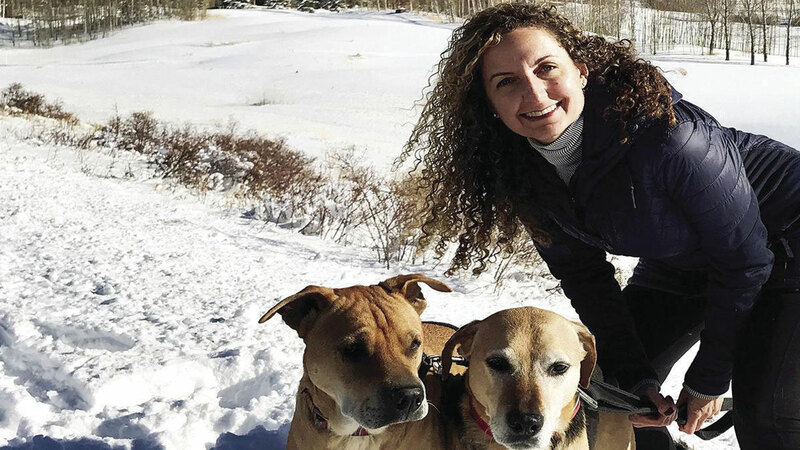 The inaugural monthly walking series gives community members and visiting guests the opportunity to discuss current events, topics, and town projects that interest them with Mountain Village Mayor Laila Benitez. “I heard from a lot of people that live here that they would come to see me, but would never come to a Town Council meeting, and it would be great if we had an opportunity to talk that is more casual,” Mayor Benitez said of the idea to host such walks. If you are interested in talking with Mayor Benitez, all are welcome to join in the walk around Mountain Village. To learn more about Mayor Benitez, please visit townofmountainvillage.com/meet-the-mayor . Bringing together community members and emergency responders, the Mountain Village Police Department is hosting their seventh annual National Night Out Tuesday, August 7 from 5 to 8 p.m. The community is invited to join their neighbors, police, fire, and EMS teams at Mountain Village’s Meadows Parking Lot located at Adams Ranch Rd for free ice cream, BBQ, swag, games, and tours of police cars, fire trucks and an ambulance. Food will be provided by Shake N Dog Grub Shack and Telluride Fire. National Night Out, a part of the National Association of Town Watch, involves over 38 million people in 16,000-plus communities from all 50 states, U.S. territories, Canadian cities and military bases worldwide. This well-known and celebrated annual event was designed to heighten community awareness of safety and fire prevention issues, as well as to strengthen neighborhood spirit and police-community partnership. National Night Out is one of many ways local police and fire departments become acquainted with our community in a fun and relaxed atmosphere. Come to celebrate this national event referred to as America’s Night Out Against Crime. “National Night Out provides a great opportunity for our residents to get out and meet the first responders that serve them in the community. 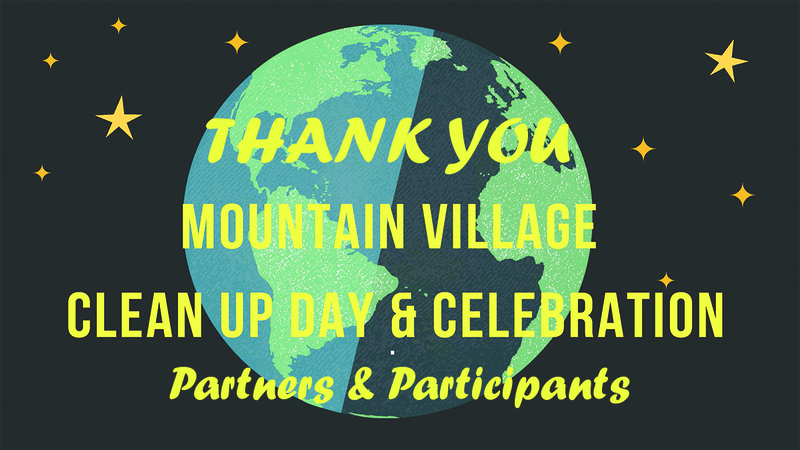 It allows our first responders and our neighbors the chance to build a safer community through open communication and community engagement in a fun, relaxed, and inclusive environment, “ said Mountain Village Police Chief Chris Broady. For more event information, please contact the Mountain Village Police Department at (970) 728-9281.